Tom and I drove farther out to the mountains to take pictures of the Mt. 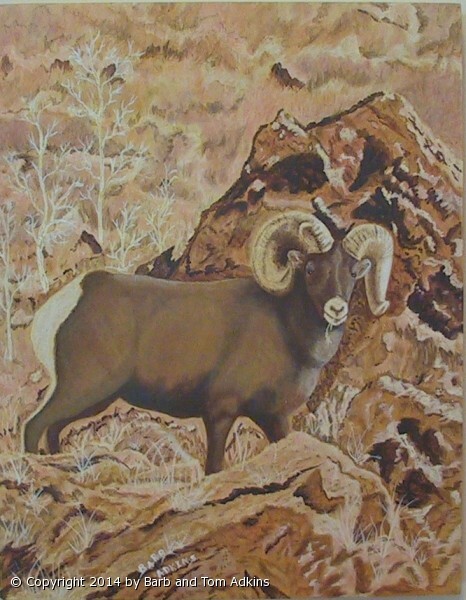 Evans Big Horn Sheep Herd during rutting season. We were out there before sunrise and able to get some nice pictures of the sheep. One of the shots that always appealed to me was of sunrise on the mountain side, turning the dull gray grass and sheep into a brilliant golden hue just as the sunlight slide across the slopes. Only one Big Horn was standing there looking out at us at that time. He probably was wondering what was going on. Since no one was a real threat to him, he just kept munching the grass that had dried and turned whitish in the sunlight. What a great way to start a new fall day in Colorado. Media: Acrylic on Cradled Birch Panel 11" x 14" x 1.5"